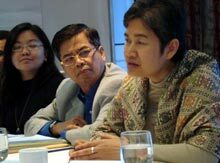 From left to right: Working Group Program Officer Maita Chan-Gonzaga, Indonesian Working Group Member Seto Harianto and Thai Working Group Chairperson Sriprapha Petcharamesree, Ph.D.
Fourteen years ago, the Association of Southeast Asian Nations (ASEAN) first discussed the establishment of an appropriate mechanism on human rights protection in the region. Finally, this might now become a reality with the conclusion of the 40th Ministerial Meeting in Manila from 29 July – 1 August 2007. 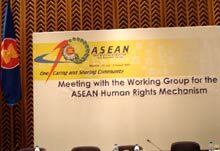 All countries reached a consensus on including a provision for the creation of a human rights body in the ASEAN Charter. The ministers instructed the High Level Task Force (HLTF), responsible for drafting the charter, to add this provision. The HLTF will submit the final draft for approval and adoption in the next ASEAN summit in Singapore in November 2007. Prior to the ministerial meeting, the Friedrich Naumann Foundation (FNF) hosted the Working Group for an ASEAN Human Rights Mechanism (Working Group)’s consultative meeting with the senior officials on 29 July 2007. The Working Group pushed for a human rights commission to be included in the charter.